I’ve been writing a lot of cover letters lately, and in every one I end up talking about my thesis. I describe my honors project as “the capstone of my collegiate academic experience”or “the culmination of my research, writing, and analytical skills.” Regardless of the number of times I write about it, I still struggle to summarize what exactly my thesis, and the process of creating it, means to me. I do know that completing it gave me an incredible feeling of achievement, accomplishment, and in all honesty, relief. Writing an honors thesis was one of the most difficult but most rewarding experiences I had at Dickinson. During the school year I often found myself procrastinating from working on my thesis by doing other schoolwork–that’s how consuming an honors project can be. I probably spent more time working on my thesis than for all of my other classes combined. Even before starting my honors endeavor I had to realistically make sure I could handle the workload. In addition to being up to the amount of work, I had to make sure I could stay reasonably motivated and organized without the strict structure of a class. It was helpful knowing I had to being ready for my nearly weekly meetings with my thesis advisor, Professor Pinsker, but I also learned how to give myself realistic goals for the day, weekend, or week so it didn’t feel like I had to conquer my entire thesis every time I sat down to do work. Because I was the only history major writing an honors thesis this year, I also found it helpful to talk to other seniors working on honors projects to share strategies or just to commiserate with one another. Start research early, it’s really never a bad idea. Some of the non-traditional items (periodicals, microfilm) I ordered via inter-library loan took awhile to arrive, or multiple attempts to get the correct item– I ended up reading microfilm during finals in the fall. Also, keep your research organized so when you’re writing the final draft of your thesis the week before it’s due, you can go back and find the information you found back in October without wasting a lot of time. Speaking of research, email libraries, archives, and scholars for related information. The worst that can happen is they don’t email you back, or you can end up corresponding with a helpful librarian at the University of Wyoming who emails you PDF’s of primary sources you never would have seen otherwise. Start writing even before you have all of your ideas formulated. There’s always more research to do, so at some point you just have to grit your teeth and start typing. Even if you’ve had all of these great ideas bouncing around in your head, writing them out can really help you formulate them, or realize that they don’t make any sense. Either is helpful. Don’t be afraid to completely change what you think is your thesis statement. You’ll probably revise it at least 10 times. My proposal only vaguely resembles my final product. For a while I didn’t even know what my argument was any more. That’s fine, as long as you eventually acknowledge the fact that you’re not just showing off your research skills, but also your ability to analyze the information you’ve found. Make friends with the librarians. I spent an a large amount of time in the library, so it only made sense to befriend the people who could actually help me with my research. Did you know that seniors doing independent studies can check out books for the entire semester after filing out this form at circulation? It’s really helpful. Remember it’s your honors project. While it’s generally a good idea to listen to what your thesis advisor and reader have to say, you have the final say. But keep in mind, the entire department votes if you get honors. We spoke a lot about the identity of the black anticolonial activists (Walter White, for example), how they were a specific group of people, critical of capitalism, but not necessarily aligned with the Soviet Union. The nature of this group is in contrast with the looser coalition I have labeled the “liberal internationalists,” which encompassed the liberal spectrum, including the black anticolonialists, individuals like Eleanor Roosevelt and Pearl Buck, as well as people like Henry Luce, who would break with the liberals during the Cold War. Von Eschen described the Cold War split as being exemplified by Henry Luce, the “American Century,” economic institutions and the Truman Doctrine on one side and Henry Wallace on the other, who looked to implement a “worldwide New Deal” by raising global living standards through decolonization, also demonstrating the pervasive fear of another Great Depression. Von Eschen also described the radical anticolonialists being destroyed in the early years of the Cold War, and so liberals like Eleanor Roosevelt and Pearl Buck had to find new alliances by pursuing anti-communism. Professor von Eschen gave me a nice overview of the newly independent India in the early Cold War, how they rejected the capitalist-based version of American democracy and instead pursued a new kind of democracy that was not based around the concept of redistribution. Von Eschen pointed out that India was already having meetings about non-alignment during 1947, a policy that Americans couldn’t understand, but instead insisted that India must have been “duped by the communists.” (This lack of understanding reminded me of the American failure to comprehend the Indian move to civil disobedience during the war with the Quit India movement.) India would become the biggest voice in the Korean War against partition, and were firmly against the Truman Doctrine. Von Eschen also pointed me towards the individuals in the State Department, like Chester Bowles, who were sympathetic towards India, but were overruled by the Department’s firm military alliance with Pakistan. Von Eschen urged me to place India’s consideration of independence within the larger geopolitical scope. We discussed wartime anticolonialism as an “extension of Wilsonian internationalism,” which was interrupted by the Depression. Von Eschen described Wilsonianism as being an anticolonial ideology, focused on making the world safe for American democracy and capitalism, while restricting the British and French control of the world. Thus, Wilsonian internationalism was based in American national interests. Professor von Eschen recommended that I look at Alan Brinkley’s new biography: The Publisher: Henry Luce and his American Century (2010) and Erez Manela’s book: The Wilsonian Moment: Self-Determination and the International Origins of Anticolonial Nationalism (2009). It’s done. Well, I’ve finished writing the first draft. Reaching a total of 86 pages, my draft reflects the inclusive nature of the India Lobby itself. I know that I will have to make my final paper substantially more concise, but I’m currently operating under the principle of put it all in now and take it out later. I’ve actually not even fit all I wanted to say in this draft: here’s a two-page write-up of the National Committee for India’s Independence that I never seemed to find a spot for in the paper. I think that I’ll want to condense my descriptions of the official events in the U.S.-India relationship (like the Phillips mission) in particular to focus my narrative more around the India Lobby itself. I’ve added in subheadings in my two narrative chapters to provide more organizational structure. I decided to divide the narrative between the Cripps mission and the Quit India movement, the point when I argue, the India Lobby employed the internationalist rhetoric it had developed in strategic action. At this point, I sort of have nonexistent chapter titles, and I think I still need to figure out how to properly cite items from microfilm and manuscript collection, but for a March 1 deadline, I’m satisfied. I’ve spent the past week writing the narrative paragraphs of my thesis, covering the Atlantic Charter (August 1941) through the Phillips mission (December 1942). I’m planning going up through the Phillips leak (July 1944), though I’m already at 30 pages for the combined 2 chapters. At this stage in my writing, I’m still pretty wordy, but I not planning on editing until just before I turn it in on March 1st. When I was writing I didn’t create a break between the two chapters because I wanted to see how my research fit into the narrative. Right now I’ve made a tentative chapter break after the Cripps Mission (April 1942) as the point where India Lobby activity begins to really pick up, but if I can condense the first section a bit, I might move this later. So far the narrative has naturally lent itself to alternating between Lobby testimony (India Today, NAACP Papers) and a more official account (FRUS) of the events. Most of my writing is centered around primary source evidence, and I’m not sure if I should be incorporating more secondary source arguments in these two chapters, or not as much because I will have a chapter devoted to historiography. Here’s the chronology that I’ve made from my primary sources that I’ve been using while writing my narrative chapters. This version goes through 1943, though I’m working on expanding it through 1945. Because I made indexes for the NAACP Papers and Emanuel Celler Papers previously, I haven’t completely combined all of the sources into this one document, but it’s pretty complete. As far as research goes, I haven’t done too much this past week since I’ve being doing a lot of writing. I have continued reading Nico Slate’s, Colored Cosmopolitanism, now that I have the physical book, and I’ve started to look into sources on the American Zionist Emergency Council using the book that Prof. Commins lent me: Edward Tivnan, The Lobby: Jewish Political Power and American Foreign Policy (1987). Display Ads for Independence, 1942-1945: New York Times, September 28, 1942, pg. 9; The Washington Post, March 22, 1943, pg. 13; The Washington Post, September 19, 1944, pg. 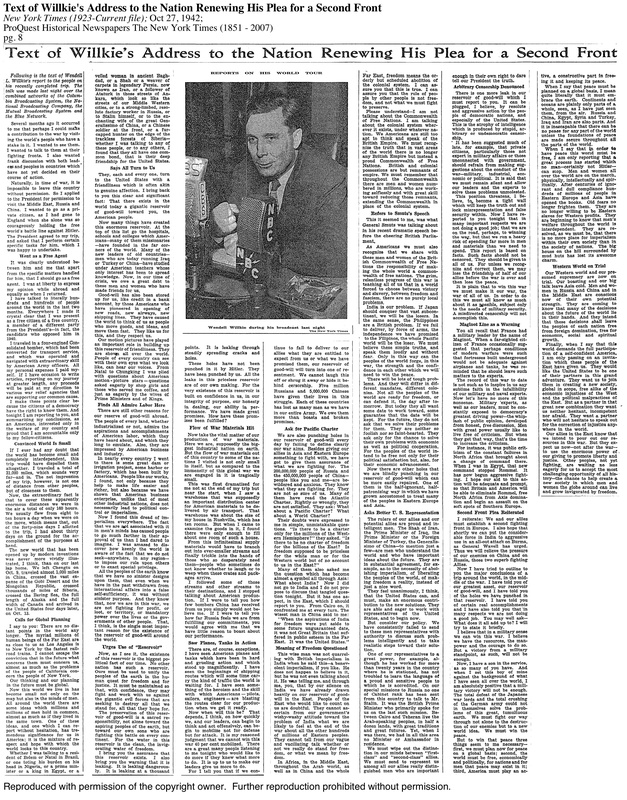 6; New York Times, March 1, 1945, pg. 37. New York Times Editorial Cartoons during WWII: “A London Critic and the India Problem,” March 1, 1942, pg. E3; “The Song of India,” March 15, 1942, pg. E9; “Mohandas K. Gandhi,” NYT, March 29, 1942, pg. E4; “Britain’s Mr. Low Examines the India Question,” August 9, 1942, pg. E3; “Mother India,” NYT, August 9, 1942, pg. E3; “As Some Britons See India,” NYT, January 3, 1943, pg. E4; “A Need for Statesmanship,” January 31, 1943, pg. E6. At this point I’ve written about 8 pages that focus on the period from the Atlantic Conference (August 1941) through Pearl Harbor. Because I’m framing the Atlantic Charter within the context of FDR’s state of the union, “Four Freedoms,” speech and earlier Wilsonian internationalism, I’ve begun to introduce what I mean by “liberal internationalism,” and who J.J. Singh and the India Lobby attempted to affiliate themselves, and Indian independence, with. Using sources like Warren Kuchl’s article on internationalism in Alexander DeConde’s Encyclopedia of American Foreign Policy: Studies of the Principle Movements and Ideas (1978) and G. John Ikenberry’s, The Crisis of American Foreign Policy: Wilsonianism in the Twenty-first Century (2009), I’m trying to get an idea of the historical transformation of internationalism without delving into the political science meaning of “liberal internationalism.” In Bruce Cummings’ study, The Origins of the Korean War (1990), for example, Cummings describes two camps of internationalism at the end of WWII: the left-liberal-internationalism that would be embodied by Henry Wallace and his 1948 presidential campaign that emphasized an “open door” and principles of universalism and democratization vs. the Republican internationalists, who in the Cold War would advocate containment to combat the spread of communism (27-29). In a more practical application, I’ve been able to find connections between the ACLU and the India League of America. Roger Baldwin and John Haynes Holmes, who were cofounders of the ACLU, and were members of the League’s Advisory Board by March 1942. The League elected Baldwin as its treasurer in December 1942. Holmes wrote to Walter White on January 18, 1943 (not in his capacity as a member of the League), before White joined the League. I’ve flipped through a history of the ACLU, Judy Kutulas’ The American Civil Liberties Union and the Making of Modern Liberalism, 1930-1960 (2006), which describes the institutionalization of the ACLU from a radical organization to one that “deliberately cultivated liberal respectability,” which seems in line with the evolution of the India Lobby to a certain extent (Kutulas, 2). Kutulas’ book also introduced me to the “People’s Front,” which she describes as promoting “the fusion of civil liberties and liberalism by shifting the national conversation toward shared values” (Kutulas, 6). Because this coalition was intertwined with undercurrents connected to the American Communist Party, I’m not sure if this is the type of liberal group I want to explore further as an example of the India Lobby’s tactics. Based on my recent discovery of the Baldwin connection between the India Lobby and the established American liberal coalition, it seems like I can draw the lines between the India Lobby and liberal internationalists (like Pearl Buck for example), but my evidence for these characters is based on letter heads and not necessarily firsthand testimony. Because I do have more substantial evidence for both White and Celler, perhaps I can use them as tactical case-studies to demonstrate Singh and the Lobby’s larger strategy vision–placing Indian independence in the greater coalition of liberal internationalists. The Protestant missionary movement, although not allied exclusively with the Republican party, provided right internationalism with a number of outspoken advocates and a steady stream of intellectual energy. Grounded in the universalist values of Christianity, missionaries had been powerful promoters of internationalist thinking since the nineteenth century. In general, they encouraged a U.S.-centered internationalism based on spreading American values and institutions and transforming other nations along American lines (Klein, 29-30). As a counterexample, however, Pearl Buck’s parents were Christian missionaries in China, and Buck aligned herself with not only the China Lobby, but the India Lobby, and black civil rights activities in the U.S.